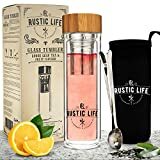 Introducing The High Quality Glass Tumbler Set By Rustic Life The most complete and high quality glass tumbler set you'll see on Amazon! With each purchase you get: · A Premium quality, 14Oz/400ml Insulated Glass Tumbler with a Stainless Steel Infuser · An exclusive Rustic Life`s Stainless Steel tea / coffee scoop for precise measuring and a bag clip · A Thermal Neoprene Sleeve for your Tumbler to keep it really hot or cold Featuring Only The Best Quality Materials & Craftsmanship! Our traveling Glass Tumbler features a Borosilicate, double walled insulation for maximum temperature preservation. 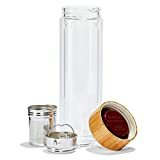 A very dashing bamboo cap for a natural feel and a superior, very durable stainless steel strainer for keeping your fruits / veggies and enjoy delicious infused juices or drinks and infuser basket for making your choice of the healthiest loose leaf herbal tea. Maximum Portability With a capability of 400ml/14 Oz, its smart size for the splendid grip and the thickest-bottomed design in the market for extra safety, you can simply carry your admired drinks everywhere and with ease! Enjoy fruit water of any kind (even fruit smoothies), hot loose leaf herbal tea, Organic green tea, fruit juices, hot coffee or enjoy vegan-friendly drinks by infusing your veggies! And with our premium quality Stainless Steel tea / coffee scoop, you can make the perfect tea and seal your loose leaf herbal tea bag with its strong clip. 100% Money Back Guarantee For 60 Days We simply know you love having infused drinks with our glass tumbler set, that's why we offer you a 100% Money Back Guarantee For 60 Days and throw in an extra replacement guarantee to make you feel you're in the best hands possible! So do not let this risk-free deal go to waste! Click Add To Cart Now While You Can! This modern tumbler has a double-walled porcelain interior sheathed in stainless steel. It comes complete with an infuser for brewing your favorite cup of tea at the office or on the go. Hand wash only. Holds 12oz (350mL) of tea. 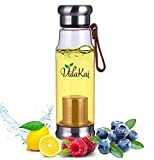 Stay hydrated wherever your life takes you with the tastefully-designed, shatterproof, loose leaf tea and fruit infuser water bottle by VidaKai (Vida=Life, Kai=Water/Strength). Whether it's creating refreshing fruit-infused water (with cut up fruit) or brewing your prized loose leaf tea (either hot or cold) or coffee (please use medium grind) for your on-the-go lifestyle, you will quickly enjoy the convenience of this 2-in-1 tea/fruit infuser. The water bottle's shatterproof 100% BPA-Free Tritan plastic and stainless steel construction (unlike the more fragile glass versions) safely handles temperatures of up to 225°F. The included Neoprene sleeve will keep your tea or coffee warmer, drinks cooler and provide extra protection for your water bottle. Food-grade silicone seals tight and prevents leakage of your hot and cold beverages. Perfect for use at the office, home, car, gym, and during outdoor activities. You'll save precious cabinet space, too. Who wants to store a medley of single purpose water bottles when one bottle handles multiple tasks? Product fully disassembles for dishwasher-safe cleaning or easy hand wash. Customer satisfaction is our #1 priority and is our core business philosophy. If you face any issues whatsoever with your water bottle, please contact us (Rohego) directly and we will immediately issue a no-hassle, full refund.Click the "add to cart" button and order your dashing loose leaf tea and fruit infuser water bottle today. Savor the unparalleled flavor of loose leaf tea with this premium quality tea infuser. Once you've used our tea strainer you might look back on your tea bag days as sheer savagery! Infusing loose leaf tea is well known to draw the best flavor out of your esteemed blend. Our superior, fine mesh strainer is the best way to enjoy the soothing effects of a beverage that is steeped in stress-relieving goodness. The mesh on this tea strainer is designed to promote the easy in and out flow of water while, at the same time, retaining most of the tea leaves resulting in a more rewarding tea drinking experience. With this food-grade, stainless steel tea infuser, you can steep tea directly in your prized mug as it fits most cups easily. It's also designed with two handles to reduce the risk of scalding and comes with a lid that doubles as a plate for the tea strainer when your brew is ready. You haven't really had a good cup of tea unless it's prepared with loose leaf tea. Order your tea infuser now for an exceptional brew without the tea leaf dregs. THE PERFECT GLASS TUMBLER FOR YOUR DAILY USE Do you want a perfectly multifunctional tumbler? Looking to keep your drinks perfectly cold/ warm? Looking for an out of the ordinary tumbler for work, school or a day out? Do you love drinking your favorite beverages on the go? Then our Insulated Glass Tumbler is exactly what you are looking for. 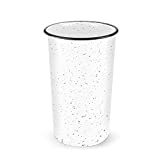 Designed for your everyday beverage drinking use Whether you’re going to work, for picnics, workout/ yoga sessions, to the beach or for road trips, this glass tumbler is splendid for on the go use! Features a unique custom design excellent for herbal, green or black tea, matcha latte, coffee brewing, iced tea, fruit water, lemonade, detox drinks, loose leaf, and many other beverages An out of the ordinary tumbler construction you’ll love Our tumblers boost an elegant, futuristic design that includes; a stainless steel strainer that filters your ingredient & tea mixtures, a superb bamboo lid that prevents spilling & maintains your drink temperature for longer & a lightweight classy finish so you can carry this bottle wherever. Keep your drinks at optimum temperature for longer With a supreme double wall insulation, which keeps your popular hot drinks perfectly hot & maintains the cool levels of your cold drinks for longer periods, this Insulated Mug is a must-have for anyone who cherishes enjoying his/her drinks super-hot or crispy cold. Click Add to Cart Now, and Start Enjoying Unrivalled Beverage Drinking Experience! Savor life with our tea bottle, drink tea on-the-go the travel tea mug lets you to take your esteemed drinks with you no matter where you go. Our tea strainer basket is easy to use and makes tea steeping fun. Experience the joy of tea at home, work or even on the train. Unique tea maker the tea maker has a unique design unlike all the identical bamboo bottles on the market. With two openings and two twist-off stainless steel lids, it allows for easy cleaning and drying. This tea brewer is both functional and elegant. Organic drinking experience enjoy an organic drinking experience without plastic aftertaste or musty odors. Our tea cup is BPA-free. You can savor your cup of tea knowing that your tea only touches glass and steel. Insulated design double wall glass keeps your tea at just the right temperature. Keep your hot drinks hot and your iced drinks cold for up to 90 minutes. Gift box packaging the elegant packaging is designed to impress any tea drinker. 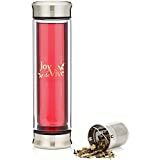 Not only is this a perfect product for you, but also a immaculate gift for someone you want to spoil Meaningful message "joy de vive" is based on the 17th century French idiom translated as the joy of living. Use our tea tumbler to experience the joy of life through brewing a perfect cup of your beloved tea. Directions for use: begin with a clean, disassembled tumbler and add your prized tea to the basket. Start with your tumbler positioned upside-down-insert tea basket into bottom of tumbler glass until it snaps into place. Close the bottom lid (with non-slip pad) securely and flip tumbler upright. Fill with water and enjoy your tea after steeping or close the top lid and save for later. Savor life by clicking "add to cart" button above. 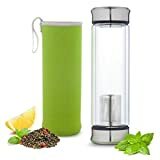 "Tea Infuser Bottle-16oz-Double Wall -Tea Tumbler-For Loose Leaf Tea & Fruit infusion-Glass Water Bottle w/ Strainer Lid-Travel Mug For Hot & Cold Beverages -Lose Weight-by My Healthy Way"
YUCK.... Another plastic water bottle ruins something you had hoped would be delicious. Why is it, that so many water bottle infusers change the flavor of what's in them? Is it really that hard to find a tea infuser cute and travel mug that simply does it's job? NOT REALLY... My Healthy Way has combined superior durability and taste preservation in our double walled BPA free plastic shelled glass water bottle and tea tumbler ! We took notes in the market to see what people loved, and what they didn't love so much to bring you an unbeatable fusion of only the best aspects of the excellent tea tumblers and glass water bottles. LOOSE LEAF TEA FRIENDLY Our perfectly designed stainless steel strainer makes it a breeze to put whatever herbs, leaves, and spices you can imagine in to build your adept glass of teavana tea or fruit infusions. Our internal borosilicate glass chamber is perfectly safe for both hot and cold liquids, so create away! GUARANTEED Remember, we've got your back no matter what, with a full lifetime replacement/refund guarantee! Our customer service is second to none, and we'll be here if you need us. INFUSE LIKE A PRO, AND CLICK THE "ADD TO CART" BUTTON NOW!! IDEAL FOR TEATOX & DETOX PROGRAMSDetox on the move is simple with the Zen Tumbler at hand. Try a Teatox - gentle way of cleansing your body with tea and herbs. Zen Tumbler is an ideal partner for the healthy infusions! FRUIT, CRYSTAL & ESSENTIAL OIL INFUSIONSHave you tried to drink more water and actually love it? Prepare your admired fruit water easily with the ZEN Tumbler. 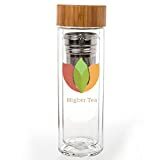 You can use it as Glass Water bottle for Crystal Infusions (we share some recipes on our blog) or prepare essential oil recipes if you are a health guru.5***** RATED, STYLISH AND DURABLE Trust other happy buyers who chose the Zen Tumbler over other tea accessories on the market. Stand out with the beautiful Zen design. Strong, durable and eco-friendly materials do make a difference - the Zen Tumbler will stay with you for longer. HOW TO PREPARE THE PERFECT INFUSION, STEP-BY-STEP *You Are Zen uniquely designed filter can act both as an infuser (tea basket) and a filter - no unnecessary extra parts, less is more. It's convenient and versatile! 1. Add the tea of your choice directly into the filter 2. Pour freshly boiled water 3. Allow the first steam to vanish 4. Screw the bamboo lid 5. When ready, remove the basket with the tea leaves 6. 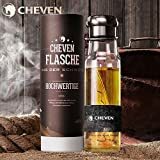 Enjoy your tea pure and mellow HINTFor stronger tea infusions or to use with fruits, add the fruit or tea directly into the bottle. The stainless steel filter will keep the leaves in place. WE LOVE TO SHARE IDEAS. TRY OUT THE **British Zen Tea Recipe** Use some finest Earl Grey loose leaf tea Add the tea directly into the filter Pour freshly boiled water Wait 2-3 minutes Remove the filter Add a hint of milk Stir and enjoy! CLICK THE "ADD TO CART" BUTTON AT THE TOP RIGHT OF THE PAGE NOW AND CHOOSE A BETTER LIFE! LOWEST PRICE 50% OFF SALE! 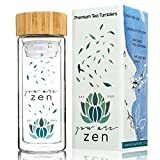 Eco-Friendly Bamboo Tea Tumbler with Infuser. Vacuum Insulated, BPA Free and Leak Proof. Holds 14 Fluid Ounces. - This stunning Asobu Tumbler will certainly make you smile when sipping your favorite beverage. This "camping" style tumbler comes in an array of four nature inspired colors, giving you that outdoor feeling without compromising quality. 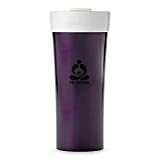 Get the color of your choice or one of each color either way they make for stunning presentation and the Coffee or tea sure taste better when you are drinking from the Happy Trails Tumbler. Dream of the summer camping trails or the hike up the mountain while you drink from your rustic looking coffee tumbler. - - Relax, be happy and get back to nature with the Happy Trails tumbler you're sure to come back for more!